For the past two weeks I’ve been ruling centuries of kingdoms in Reigns: Her Majesty, reincarnated as queen in perpetuum. 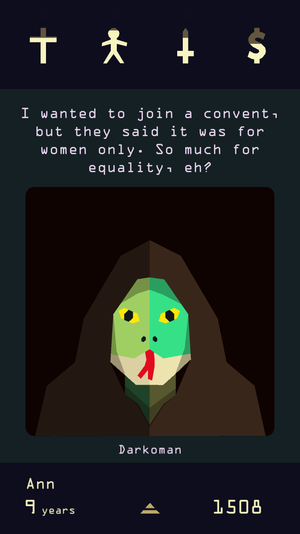 The iOS game succeeds its king-centric predecessor, Reigns, in which the player makes choices to advance the narrative by swiping left or right on cards, as in Tinder. Technology and culture journalist and author Leigh Alexander is the narrative designer for Reigns: Her Majesty. Alexander’s renowned career in games criticism makes her a fitting candidate to describe female perseverance within an oppressive framework. The former Editor-at-Large for Gamasutra and former Editor-In-Chief for Offworld (a gaming site with a focus on diversity and inclusiveness within the gaming community) was among several high-profile women targeted and harassed in connection with #GamerGate. Since that she has been exploring tech mysticism, and producing an ASMR video series devoted to vintage computer games, interests that are both highlighted in the narrative design of Reigns: Her Majesty. Reigns: Her Majesty is not simply a version of the original game with an almighty female head of state, but is instead a complex examination of the contradictory obligations and impossible choices for a woman in (proximity to) power. In Reigns, the player directly controls the throne and its succession as king, but Reigns: Her Majesty complicates that straightforward idea of power by introducing and focusing on two other practices that have historically empowered women: witchcraft and the pursuit of self-knowledge. 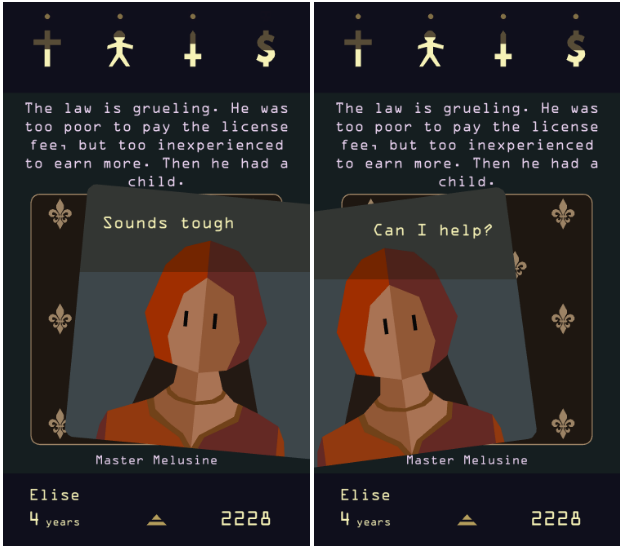 Despite the romantic medieval setting, recurring themes of magic, and speedy reincarnation without much negative consequence, playing Reigns: Her Majesty is both a fantastic exercise in pragmatism, and a lesson in the slow and demanding work of women’s progress over time. The gameplay is similar to the original: the queen is presented with a series of unpredictable requests and remarks from people around her, including the King, members of the royal court, the ever-infuriating Cardinal, and her subjects. She must respond with diplomacy to maintain balance between the kingdom’s factions (the church, the people, the army, and the treasury), or perish. A player advances through the game by unlocking new sets of cards, reaching personal milestones, and both acquiring and upgrading magical objects. Unlike traditional roleplay games in which a player invents a character, then acts according to their given traits to advance the narrative, ruling consistently in Reigns: Her Majesty will lead to a quick and untimely death. Ways to die include beheading by guillotine, being trampled to death by your loving subjects, rotting away in a locked tower, and, my most recurrent fatal end, being burned at the stake for heresy by the Cardinal. To survive, to avoid deposition, the queen is often forced to compromise her ideals in order to appease the kingdom’s various complex political coalitions. No matter what political ideology or code of ethics the queen subscribes to, blind adherence will cause her to be promptly de-throned. To those not privy to the motivations behind these strategic decisions, the behavior of the queen may seem volatile or erratic, stereotypical of an “irrational woman.” Alexander subverts this misogynist inclination by converting it into a strength. Being strategic and cunning are traits typically reserved for male characters in games, but in Reigns 2, success as a queen is directly related to developing those complex character traits. 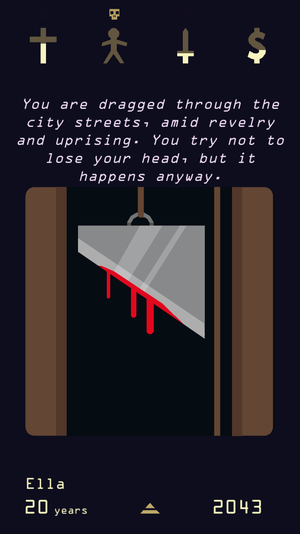 Another frustratingly realistic feature of Reigns: Her Majesty is the contingent advancement through the game, a movement that is repeatedly hindered by factors seemingly outside of the player’s control: the astrological sign your reign begins on, for example, or interpersonal politics between eccentric members of your court. The All-Mother, the pagan goddess who controls the magic forces driving the game, will occasionally drop hints about disrupting the system’s mysterious mechanics, but these divine clues are subtle and, in my experience, often indecipherable. However, players who pay enough careful and consistent attention to these hints will eventually unlock crucial items, like the magic mirror and destiny altering clock. These empower the queen by alleviating some of the environmental contexts that impede the progress of a reign: the magic mirror can offset imbalance between the four political factions and the destiny altering clock allows the queen to switch astrological signs without being reborn. With enough introspection a player can learn the effects of ruling during certain astrological signs and can engineer further progress in a single reign by strategically switching and opening up different webs of possibilities. The queen must become a master of pragmatic choices. At times ways to advance are unavailable to your player, due to the particular political contexts of their rule. Other times, the progressive or kind action seems (or is) futile. And you are frequently forced to act obediently or outright lie in order to persist. It is possible to live through several generations of your dynasty, swiping through similar interactions with people in power, only to meet the same gruesome end as your predecessors, having effected little change. However, the world may surprise you with a kind gesture every now and then. The small accomplishments accumulate, motivating a player to rule again and again in the face of such evident inertia. The ability to reincarnate through multiple generations and experience many different political eras firsthand allows the player to accumulate knowledge directly, in effect, gaining through experience what is usually passed down indirectly, as wisdom from women who came before. This nuanced depiction of female power extends beyond the design of the overarching political system to the personhood of individual queens. The hilarious and delightful writing kept me engaged and continuously swiping onward. As in life, the player is capable of a range of emotional responses to instances of microaggressions and outright sexism that resonate deeply with contemporary realities despite taking place in a medieval context. The church complains about your plunging necklines, the king wields power irresponsibly due to his prototypical male ego, and a mysterious sect of snake-men harass your subjects and insist on holding free speech rallies. Alexander perfectly portrays these situations with short, quippy dialog that reads like a snarky feminist Twitter feed. This criticality is also evident in the player’s engagement with a neoliberal magic mirror that encourages narcissism and selfishness masked as self-care. Affirming (swiping right on) the magic mirror’s problematic ideologies alleviates any imbalance between political factions. The narcissism helps the queen persevere, which is a nod to the mandatory philosophical concessions women make when surviving and ascending to power within an inherently flawed and inequitable system. [Spoiler Warning:] The dark humor, marked with a twinge of optimism, that runs through the narrative in Reigns: Her Majesty demonstrates the relatability of the complex struggle of womanhood over time. The frequent futility of a single reign in concert with slow but measurable progress over centuries imbues the player with a sense of increasing duty to, and respect for, queens maneuvering in complicated political contexts before our time. I haven’t yet achieved one of the three possible endings, but in order to achieve the only true end, you have to kill the king.